In two different bowls, separate the egg yolks from the whites. Beat egg yolks and 7 tablespoons of sugar together in a large bowl with an electric mixer until pale and thick. Add the mascarpone and mix, until blended and creamy. If you are using cream instead, whip it until it forms soft peaks and incorporate it to the mascarpone, stirring gently with a wooden spoon. You might as well need to change the amount of tablespoons of sugar, depending on the quantity of sugar contained in cream. Add 6 tablespoons of Limoncello and mix, if you are using an electric mixer, or stir with a wooden spoon. The amount of Limoncello varies depending on your taste. I would suggest to start by adding 3 spoons and tasting it, then adjust. If you go for the alcohol-free version, you can add the juice of half a lemon instead. Now, beat egg whites with a hand mixer until they form firm, stiff peaks. Using a silicone spatula, gently fold egg whites into the mascarpone mixture. With a peeler or a knife, remove the zest from the lemon. In a small pan, heat water, half lemon juice (or one lemon juice, for the alcohol free version), the lemon zest, the rest of sugar and Limoncello to a boil. Reduce heat to low and cook until sugar is dissolved. Set aside for some minutes to get cool and remove the lemon zest. Pour the syrup into a shallow bowl and dip each biscuit quickly on both sides. Lay them side by side to cover the base of the pyrex dish. 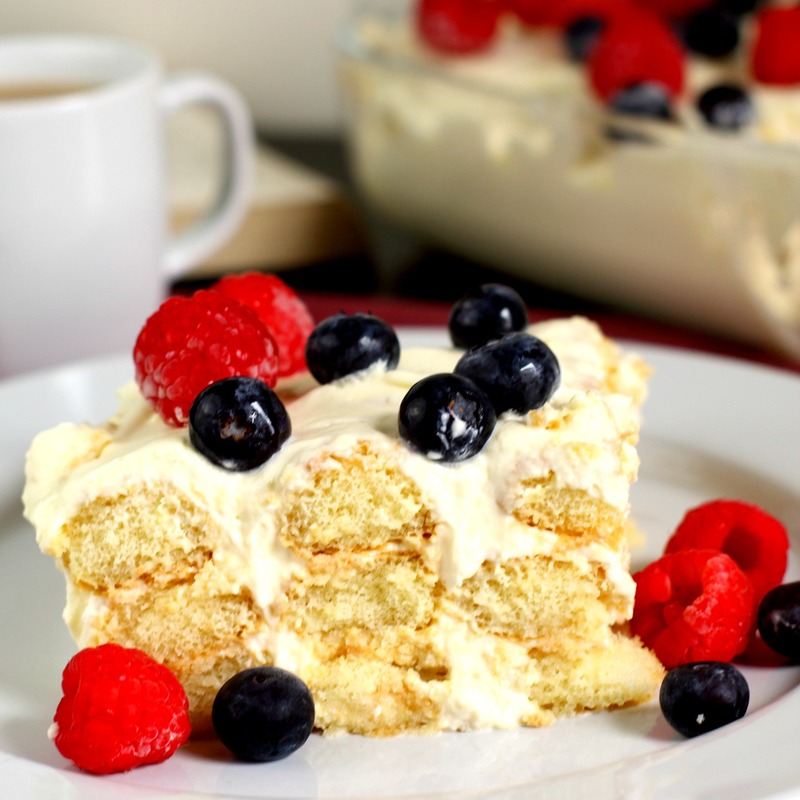 Cover the ladyfingers with 1/3 of the cream, and repeat layers two times, ending with a layer of mascarpone cream. It might be necessary to break some cookies to fill some empty spaces. Refrigerate for 6 hours, or overnight. Decorate it with red fruits and serve. This alternative version of the classic Tiramisù is the perfect refreshing and aromatic dessert for your dinner parties and family gatherings. 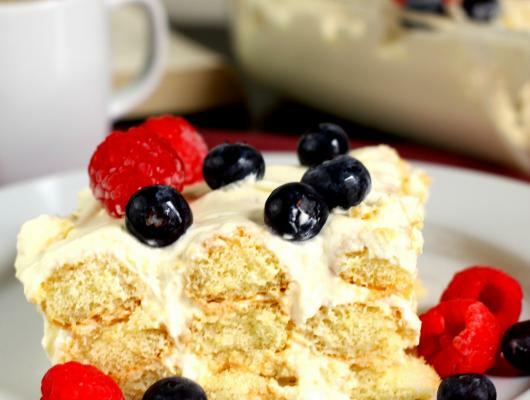 The Limoncello and lemon soaked ladyfingers are layered with a soft and airy creamy filling made of mascarpone, eggs and sugar. If you prefer an alcohol-free, no-eggs versions, you'll find instructions in the method!